A Deadball Era outfielder, Frank Delahanty rated middle-of-the-pack among the ballplaying Delahanty brothers. The accomplishments of his six-year major league career were decidedly modest. Frank was little more than a journeyman, nowhere near the player that his Hall of Fame brother Ed had been. Nor was Frank in the same baseball class as his brother Jimmy. He might not even have been as good as Joe. Only marginal major leaguer Tom and career minor leaguer Willie Delahanty were inferior players. But away from the diamond, Frank had prospects that no other Delahanty could match. Handsome, ambitious, and law school-educated, he seemed destined for a bright future in law and Democratic Party politics. Frank’s domestic situation was equally blessed, with a pretty wife and three young children at home. When he hung up his glove in late 1918, life looked rosy for Frank Delahanty. The turbulent life of Frank George Delahanty began in Cleveland on December 29, 1882. He was the ninth of ten children born to James Delahanty (1842-1919) and his wife, Bridget (née Croke, 1849-1926).2 His parents were Irish-Catholic immigrants who landed in Canada separately, met and married in Buffalo, and then moved to Cleveland, where James pursued work on the Lake Erie docks. The family settled in a large, two-story wooden frame house where the formidable Bridget Delahanty presided. Like many adult immigrants, Mrs. Delahanty disdained tomfoolery like baseball. But by the time Frank arrived she had resigned herself to her boys’ love of the game. As soon as he was able, young Frank traveled the path to a nearby amateur ballfield first blazed by his oldest brother, Ed, and followed in turn by Tom, Joe, Jimmy, [and later Willie] Delahanty. And like his brothers, he soon built a reputation for himself on the Cleveland sandlots. Frank, however, also received a first-rate education, graduating from St. Ignatius College [actually more a college-prep high school] in 1898. By 1902 the four oldest Delahanty brothers – Ed, Tom, Jimmy, and Joe – were already professional baseball players, with all but Joe having already played in the majors. Meanwhile, 19-year-old Frank was playing semipro ball in Warren, Ohio. Sources conflict regarding his entry into the pro ranks. According to one report, the Albany Senators of the New York State League “signed outfielder and change catcher Frank Delehanty,3 another brother of the great Ed,” in April 1902.4 But there is no evidence that Frank actually played for Albany. With Jimmy and Joe Delahanty starting the 1902 season in the Southern Association, it was later more reliably reported that “manager [Frank] Haller of Birmingham has signed infielder Frank Delehanty, hailing from Ashtabula, Ohio.”5 At 5-feet-9 and 160 pounds, the righty throwing and batting youngster was “a raw, talented kid with a crowd-drawing surname.”6 Splitting time between SA clubs in Birmingham and Atlanta, the newest Delahanty batted a soft .222, but showed promise as a flycatcher and baserunner. Their physical size difference aside, Frank Delahanty resembled his celebrated older sibling Big Ed.7 Years later, Clark Griffith remarked that all the Delahanty brothers looked alike, and that “there were about 73 of them.”7 Regrettably, Frank was also imbued with the family temperament. Tom and Joe Delahanty were subdued and stable. But the other Delahanty brothers were high-strung and frequently a handful to manage. And none more so than Frank. The first sign of the prima-donna antics that would characterize his professional career occurred early in his sophomore year when Delahanty, then the property of the Atlanta Crackers, publicly announced a preference to be “placed somewhere in the Western League … [as] Atlanta [was] a city that he does not like.”8 A demotion to Syracuse of the less competitive New York State League may not have been Frank’s notion of ideal relocation, but the posting put him in geographical position to handle an oncoming family tragedy. In early July 1903, Ed Delahanty, his life in turmoil, went AWOL from the Washington Senators, taking a train from Detroit headed East. A week later, his lifeless body was pulled from the river below Niagara Falls. The first family representatives to reach the scene were Frank, his uncle P.J. Croke, and his brother-in-law Edward Maguire, a lawyer married to Frank’s older sister Katherine. His youth notwithstanding, Frank dominated their inquiries, casting doubt on official explanations of Ed’s death, castigating the conduct of railway employees, and promising the initiation of a lawsuit on the family’s behalf.9 After Ed’s somber funeral in Cleveland, Frank returned to Syracuse for completion of the 1903 season. Although not particularly impressive statistically (a .242 BA in 118 games), his performance was evidently sufficient to earn recall to the Southern Association. After an unremarkable (.244 BA in 128 games) year with the Montgomery Senators, Frank had a breakout 1905 season playing for a league rival, the Birmingham Barons.10 By mid-August he was batting a Southern Association-leading .309 and being touted as “one of the most promising players of the day.”11 He had also become something of a headache to the Birmingham front office, being one of six Barons players to go on strike over the imposition of “deserved fines” by club management. Shortly after the dispute was “settled amicably,”12 Frank became the fourth Delahanty brother to reach the majors. His contract was purchased for $2,500 by the New York Highlanders of the American League. On August 23, 1905, 22-year-old Frank Delahanty made “a great success” of his major-league debut.13 In the first game of a doubleheader in St. Louis, he went 2-for-4 at the plate against Browns right-hander Fred Glade and played a flawless left field. But the Highlanders lost, 5-0. Switched to first base in the nightcap, Frank handled 15 of 16 chances at the unfamiliar position, while his repeat 2-for-4 performance included the ninth inning RBI-single that decided the 1-0 contest in New York favor. Thereafter, Delahanty’s bat cooled off, registering only two more hits in the next seven games. Then, a severe ankle injury suffered while playing the outfield brought Frank’s season to an abrupt conclusion. He would remain sidelined until the next spring. 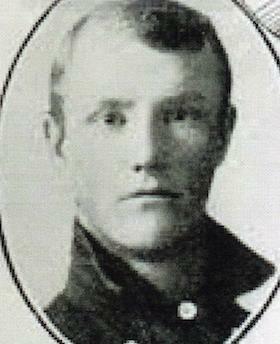 Still, Delahanty had made a fine first impression and figured prominently in Highlanders’ plans for the coming season. In the spring of 1906 Frank did little to endear himself to club management. First, he demanded a $500 share of the contract purchase price that had been paid to Birmingham the previous August.14 When the money was not forthcoming, he filed a grievance against Highlanders manager Clark Griffith and the club brass with the National Commission.15 To no great surprise, the grievance was denied. Although he reported late to the club, Delahanty became the Highlanders’ semi-regular left fielder that season, playing sound defense and contributing a .238 batting average, with 21 extra-base hits and 41 RBIs, to the second-place (90-61) New York club. Back home in Cleveland that offseason, he survived then still-risky appendectomy surgery and thereafter began the study of medicine at nearby Baldwin College. The events of early 1907 followed the pattern of the previous spring. Claiming that manager Griffith had reneged on private salary assurances, Frank refused to report to spring camp, holding out for more money. “When the management is willing to keep its promise and pay me the salary offered last fall, then I am willing to sign,” he informed the press.16 When the Highlanders appeared ready to start the season without him, Delahanty upped the stakes, informing Griffith that he intended to continue his medical studies and asking for permission to play weekends with a semipro club in Sandusky, Ohio.17 By now Griffith had tired of the young holdout’s attitude and began shopping him, offering Detroit field leader Hughie Jennings an exchange of problem children: Frank Delahanty for a trouble-making young outfielder named Ty Cobb. Jennings passed, but Griffith soon found someone else willing to take the nettlesome Delahanty off his hands, Cleveland Naps player-manager Nap Lajoie. In January 1908 Delahanty informed his new employer that he might deign to play for the Pelicans – but only on condition that his contract guarantee: (1) a salary deemed satisfactory to Delahanty; (2) that he could not be sold back to Cleveland, and (3) that his consent was obtained prior to his transfer to any other club.23 “Outside of that,” a newspaper back in Ohio observed caustically, “the management will permitted to own and operate the club, unless Delahanty should happen to think of something else he wants that would interfere.”24 The comment proved prophetic. With Delahanty under contract and the season barely a week old, Frank declined to take the field until club management satisfied an outstanding Delahanty bill at an upscale hotel.25 Hard-nosed Pelicans owner-manager Charlie Frank thereupon suspended Delahanty.26 The outcome of the hotel bill contretemps is unknown, but however it was resolved, Delahanty was back in the New Orleans lineup in time for a far more consequential incident. In late June, a New Orleans-Memphis game was decided against the Pelicans by a close bases-loaded, ball-four call in the 10th inning. Delahanty rushed in from the outfield and joined other Pelicans disputing the call by respected player-turned umpire Tom Brown. Not content with arguing, Frank pulled off Brown’s mask and spat in his face, gravely inflaming the situation. Only the intervention of local police saved Delahanty from outraged Memphis spectators. But nothing could save him from the wrath of the Southern Association. Charlie Frank quickly placed Delahanty on waivers for the purpose of giving him his unconditional release.27 No other club in the league wanted him either. Meanwhile, Southern Association President William Kavanaugh suspended Delahanty indefinitely pending a hearing on his permanent expulsion from the league. With his baseball future looking decidedly bleak, Frank was unexpectedly rescued by another notorious bad actor, newly installed New York Highlanders manager Kid Elberfeld. Notwithstanding the fact that Delahanty was under suspension in the Southern Association, Elberfeld signed him to a Highlanders contract and promptly installed him on his old stamping grounds, left field at Hilltop Park. Chagrined SA President Kavanaugh protested the signing to his American League counterpart, but AL President Ban Johnson finessed the situation. In his view, New Orleans’ release of Delahanty and his waiver by other SA clubs had obviated the need for any further proceedings on Delahanty’s eligibility to play in the Southern Association. The league’s action had effectively rendered Delahanty a free agent, and New York was therefore acting within its rights to sign him.28 Perhaps the only satisfaction that Kavanaugh and others in the Southern Association would ever derive from the affair was the fact that the acquisition of Frank Delahanty did the Highlanders little good. Although his .256 BA in 37 games was better than the .236 team norm, it did nothing to save New York (51-103) from a dead-last finish in AL standings. And both Delahanty and his savior Elberfeld would be jettisoned by the club before the next season started. Still only 26 years old, Frank Delahanty considered his options as the 1909 season approached. He then decided to postpone continuation of his medical studies until he had built more of a financial nest egg.29 For once, Delahanty reported on time to spring camp, but New York was bent on cleaning house. In early February the club asked waivers on Frank Delahanty, deemed “an experiment not counted worthy of another trial” in one non-admiring press commentary.30 Shortly thereafter, he and pitcher Bill Hogg were sold outright to the Louisville Colonels of the American Association. Upon being informed of the transaction, Delahanty declared that he would not report. “If I cannot be a big leaguer, I will quit,” he said.31 The news was greeted with indifference in Louisville, and Delahanty soon reconsidered, signing a Colonels contract before March was out.32 His domestic situation was also undergoing a change. On April 12, 1909, Frank and 19-year-old Mary Lucina Hunt were married in Euclid, Ohio. In time, the newlyweds would have three children: Frances (born 1912), Edward (1914), and Margaret (1917). As elsewhere, Delahanty quickly wore out his welcome in Louisville. At the close of a mediocre season (.237 BA in 134 games), he was released. Signed by league rival Indianapolis for the 1910 season, the same thing happened. Frank posted tepid numbers (.230 BA in 100 games) and was released, this time well before the season’s end. Given a third chance in the American Association by the St. Paul Saints, Delahanty’s good early-season hitting was “a pleasant surprise.”33 But he soon reverted to form, both at the plate and behaviorally. His batting declined and in July Frank pulled the mask off umpire Ollie Chill and punched him in the face. By season’s end he was no longer wanted by St. Paul and was released again. In April 1912 Delahanty was claimed on waivers by the Minneapolis Millers and started the season with his fourth different American Association club.34 In midseason, he was joined by older brother Jimmy Delahanty, a far more talented player than Frank and his near-equal as an umpire abuser and malcontent.35 Whether favorably influenced by the arrival of his brother (Jimmy posted a .448 BA in 27 games) or not, Frank played “a nice game” for the Millers,36 batting a respectable .266 and providing his customarily excellent outfield defense. Minneapolis (105-60) won a third straight American Association pennant handily, but lost the postseason Western minor-league championship series to Denver, four games to one. Breaking precedent, the Millers signed Frank (and Jimmy, too) for the 1913 season. That season was more typical of Frank Delahanty. He integrated assaulting Louisville pitcher Grover Lowdermilk with a bat and a nasty set-to with umpire Jimmy Johnstone into a mild offensive campaign: .240 BA, with only 15 extra-base hits in 136 games. With his major-league career now five seasons behind him, Frank’s playing days looked numbered. But like many other fading or borderline players, his entry in the record book was expanded by the advent of the Federal League. Signed by the Pittsburgh Stogies in March 1914, he batted .239 in 41 games, and was then traded to Buffalo for utilityman Charles “Tex” McDonald. Upon arrival, Frank became the Bufffeds everyday left fielder. His batting average plummeted to .201, but his glove remained first-rate. Delahanty’s combined .979 fielding average was the 1914 Federal League best for outfielders. He returned to Buffalo for the 1915 campaign, but the club could not long carry his weak bat. In mid-May he was sold to the Springfield (Massachusetts) Tips of the independent Colonial League.37 The major-league career of Frank Delahanty had reached its end. In 287 games played for five major-league teams, he had batted a weak .226, with only 49 extra-base hits in almost 1,000 at-bats. His forte had been defense; he had once been called “the best sun fielder who ever donned a glove,”38 and the next Ty Cobb “if he could only have hit like his brother Jim.”39 Sadly for him, Frank could not hit like his brother Jim. Or like his brother Joe. Or even like Tom Delahanty [not to mention Hall of Fame brother Ed]. As a batter, Frank was about on par with youngest brother Willie, the only Delahanty brother who never saw major-league action. Rather than report to Springfield, Frank returned home to Cleveland, where he worked as an auto-company shipping clerk and played weekend ball in the city’s fast semipro league. The following year he gave professional baseball one last try, playing for manager [and hometown Cleveland friend] Bill Bradley with the Erie Sailors of the low-minors Interstate League. Frank was batting his normal .238 in 57 games when the club disbanded on August 9, 1916.40 His final baseball years were spent back in the Cleveland weekend league ranks, often playing on teams with brother Jimmy, and occasionally with Joe and Willie Delahanty, as well. A member of the Standard Parts Class A City League champs of 1918, Frank hung up his glove at the close of that season. He was now 35 years old, with a wife and three young children to support. Frank had prepared well for his retirement from the game. As his playing days wound down, he resumed taking classes at [now] Baldwin Wallace College, but had shifted his concentration from medical studies to law, a seemingly natural calling for someone endowed with his contentious, adversarial personality. Following graduation with a BA in Law and his passage of the bar exam, Frank George Delahanty was admitted to the Ohio Bar in June 1918.41 He then opened a general law practice operated from his home. But for the short term, Delahanty devoted his energies to gaining political office. Given the reverence accorded his surname by Clevelanders, and likely the political pull of older brother Joe,42 Frank gained the Democratic Party nod to stand for one of Cuyahoga County’s 13 seats in the Ohio House of Representatives that November. He was an easy victor.43 He was sworn into office in January 1919, and the future looked bright. The only problem: During this stage of his life, Frank Delahanty was a bad seed, corrupt to the core. Upon his release from prison, Delahanty did not stay out of trouble long. Caught in the act of bootlegging by federal agents once again and now a recidivist offender, Delahanty agreed to turn state’s evidence and assist the US Attorney’s Office to prosecute his confederates. Shortly before he was due to appear before the grand jury, however, Delahanty was reported missing by his wife.52 But Cleveland police quickly found him at the train station. Once hauled before the panel, Delahanty fingered a Parma, Ohio, coal dealer and a small-time Cleveland gangster as the ringleaders of the bootlegging operation. Out of legal jeopardy himself, Delahanty thereafter kept a low profile. In September 1930 the name Frank Delahanty was back in newsprint. The occasion: a divorce suit instituted by his wife, Mary, on grounds of nonsupport. The action was uncontested, and Mary Delahanty had no idea of the respondent’s present whereabouts. She had not seen her husband for three years. Divorce reportage implied or stated that the absent Frank Delahanty was currently a prison inmate.53 But he was not. Rather, he was now the resident of a Cleveland flophouse, where he gave 1930 US Census takers the occupation of lawyer. But that was improbable. Regrettably, the passage of time has obscured the details of Delahanty’s probable disbarment, but then, as now, those convicted of crimes of moral turpitude (bribery) and/or engaging in a course of continuing criminal conduct (bootlegging) rarely got to keep their license to practice law.54 Like his unemployed brother Jimmy, another of the flophouse’s unfortunate inhabitants, Frank was likely without work [of the legal kind, anyway]. Whether the product of genuine reformation of character, or because Prohibition was about to be abolished, or because his 50th birthday was now on the horizon, Frank Delahanty began the slow process of rehabilitating his life in the early 1930s. His disgrace notwithstanding, he still had friends in City Hall. In time, he was given a place on the municipal payroll, and quietly worked his way up the ladder. By 1940 Frank had ascended to the position of supervisor of city streets, a post that permitted him to put his hard-luck brothers Jimmy and Willie on the department payroll. The bearer of a hallowed baseball last name, Frank also worked his way back into the game’s good graces. By the mid-1930s, he and his surviving brothers55 were regular attendees at Cleveland Indians banquets and occasional old-timer’s game participants. One year Frank even played for the side captained by his one-time nemesis Nap Lajoie. And like all the family, he took great pride in the 1945 Hall of Fame enshrinement of the long-deceased Ed Delahanty. Into old age Frank Delahanty lived quietly, sharing a rental home with his daughters Frances and Margaret. But it required little prodding to get him to reminisce about his playing days or to expound on the exploits of the Delahanty brothers.56 Suffering from heart disease and other ailments, Frank suffered serious fractures when he took a fall at home in the summer of 1966. Transported to Women’s Hospital in Cleveland, he died there on July 22, 1966. Frank George Delahanty was 82. Following a Funeral Mass at St. Francis Church, the last of the ballplaying Delahanty brothers was laid to rest near other family members in Calvary Cemetery.57 Looking back at a long life, it cannot reasonably be said that Frank Delahanty was an outstanding ballplayer. Nor for much of his life was he a good citizen. But as he grew older, he seems to have become a better man, and thus, an object lesson for us all. Sources for the biographical detail provided above include the Frank Delahanty file maintained at the Giamatti Research Center, National Baseball Hall of Fame and Museum, Cooperstown, New York; Jerrold Casway, Ed Delahanty and the Emerald Age of Baseball (South Bend, Indiana: University of Notre Dame Press, 2004); Delahanty family-tree postings accessed via Ancestry.com; and various of the newspaper articles cited below. Unless otherwise noted, baseball stats have been taken from Baseball-Reference.com, Retrosheet, and The Encyclopedia of Minor League Baseball, Lloyd Johnson and Miles Wolff, eds. (Durham, North Carolina: Baseball America, Inc., 2nd ed., 1997). 1 See “Last Ballplaying Delahanty Is Dead,” Cleveland Plain Dealer, July 27, 1966. 2 The other Delahanty children were Edward (born 1867), Thomas (1872), Katherine (1874), Joseph (1875), James (1879), Florence (1880), and William (1885). Two others, a female (name unknown, born 1866) and Martin (1868), did not survive infancy. 3 For the most part, the sporting press used the variant spelling Delehanty for the family surname. Finally in January 1911, Jimmy complained, informing the press, “It’s Delahanty, not Delehanty,” adding that there was “nothing quite so annoying as having one’s name repeatedly spelled wrong.” Sporting Life, January 28, 1911. But even after that correction, the Delehanty spelling frequently appeared in newsprint. 4 Sporting Life, April 26, 1902. 5 Sporting Life, June 21, 1902. 6 Jerrold Casway, Ed Delahanty and the Emerald Age of Baseball (South Bend, Indiana: University of Notre Dame Press, 2004), 233. 7 See Mike Sowell, July 2, 1903: The Mysterious Death of Hall-of-Famer Big Ed Delahanty (New York: Macmillan, 1992), 116. 8 As per Sporting Life, May 2, 1903. 9 For more on the events attending and subsequent to the death of Ed Delahanty, see Casway, 277-281, and Sowell, 255-280. 10 Montgomery’s transfer of Delahanty to Birmingham was noted in Sporting Life, April 1, 1905. 11 Sporting Life, August 26, 1905. 12 Ibid. But according to the New York Times, August 22, 1905, Delahanty had been suspended by Birmingham and was at home in Cleveland when his contract was sold to New York. 13 In the estimation of Sporting Life, September 2, 1905. 14 As reported in the New York Times, February 10, 1906. 15 As reported in Sporting Life, March 17, 1906. 16 As quoted in the Cleveland Plain Dealer and New York Times, March 27, 1907. Reportedly, $300 separated the parties. 17 As reported in the Philadelphia Inquirer, April 18, 1907, and Sporting Life, April 27, 1907. 18 As reported in Sporting Life, May 26, 1907. 19 As reported in the Cleveland Plain Dealer, August 1, 1907, and elsewhere. Simultaneously, Lajoie suspended Naps first baseman George Stovall. The two had had a heated argument at a Philadelphia hotel that ended with Stovall throwing a chair at his manager. 20 Said Delahanty: “I will make those who say I was drunk in the East prove their assertions.” Cleveland Plain Dealer, August 5, 1907. 21 As reported in the Cleveland Plain Dealer, December 4, 1907. See also, Denver Post, January 9, 1908. 22 The suit was grounded on a technicality: the failure of Delahanty’s contract to specify the types of conduct that might incur suspension. But as a matter of law, the claim was not without merit, and the suit dragged on for several years. Ultimately, the parties settled out of court, with the terms of the settlement undisclosed, as reported in Sporting Life, February 11, 1911. 23 As reported in the New Orleans Item, January 17, 1908, and Sporting Life, February 1, 1908. 24 Mansfield (Ohio) News, February 6, 1908. 25 As per the New Orleans Item, May 2, 1908, and Sporting Life, May 9, 1908. At issue was $39 above the Pelicans’ standard $10-a-week preseason lodging allowance. 26 As per Sporting Life, May 16, 1908. 27 As reported in the Charleston (South Carolina) News and Courier, June 30, 1908, Columbia (South Carolina) State, July 1, 1908, and newspapers throughout the Southern Association territory. 28 As reported in Sporting Life, August 8, 1908, and elsewhere. 29 As reported in the Cleveland Plain Dealer, January 29, 1909, and Sporting Life, February 13, 1909. 30 In the view of the Macon (Georgia) Telegraph, February 13, 1909. 31 Cleveland Plain Dealer, March 4, 1909. 32 As reported in the Duluth (Minnesota) News-Tribune, Evansville (Indiana) Courier and Press, and Washington (D.C.) Evening Star, March 27, 1909. 33 The descriptive of Sporting Life, May 27, 1911. 34 Delahanty’s starting a fourth consecutive season with a different league club was deemed a new American Association record in some quarters. See, e.g., the Watertown (New York) Daily Times, April 4, 1912. 35 In 1911 Jimmy had batted .339 for the Detroit Tigers, and was on the way to another solid major-league season in 1912 when he antagonized club management by fomenting an early-season player rebellion. When Jimmy suffered an injury later in the season, Detroit released him. 36 In the opinion of Baseball Magazine, July 1912. 37 As reported in the Cleveland Plain Dealer, May 18, 1915. 38 Sporting Life, November 25, 1905. 39 Sporting Life, July 23, 1914. 40 Baseball-Reference has no 1916 stats for Frank Delahanty. The above numbers were published in the 1917 Reach Guide, 224. 41 See Ohio Law Bulletin, July 1, 1918, 206. 42 Joe Delahanty had long been active in local Democratic Party affairs, and was an unsuccessful candidate for the Cleveland City Council in the November 1913 election. 43 The final election tally: Delahanty (D), 47,387; Calvert (R), 41,434. Cleveland Press, November 6, 1918. Thanks to Cleveland city attorney and SABR member Bryan Fritz for passing this info along. 44 Cincinnati Post, March 19, 1919. 45 As reported in the Cleveland Plain Dealer, March 25, 1919, and elsewhere. 46 See “Report of the Joint Legislative Committee: In re the Investigation of Certain Bribery Charges,” Ohio House Journal, Vol. 103, 1919, 1134-1136. 47 As reported in the Cincinnati Post and Cleveland Plain Dealer, November 25, 1919, and newspapers nationwide. 48 Ibid. Delahanty’s resignation letter was an empty gesture. Pursuant to Ohio law, his ability to hold office was forfeited the moment he pleaded guilty to the charges. 49 As reported in the New Orleans Times-Picayune and Philadelphia Inquirer, November 16, 1922. 50 As per the Denver Post, Duluth News-Tribune, and San Francisco Chronicle, November 17, 1922. 51 See the Cleveland Plain Dealer, November 18, 1925, and January 27, 1927. 52 As per the Cleveland Plain Dealer, May 27, 1927. 53 As reported in the Charlotte Observer, Boston Herald, and Omaha World, September 12, 1930, and newspapers nationwide. Curiously, there appears to have been no mention of the Delahanty divorce proceedings in Cleveland newspapers. 54 Inquiries directed to Ohio Supreme Court seeking the date/disposition of disciplinary proceedings against Frank G. Delahanty, Esq., were unavailing. Court staff could not uncover any pertinent record. But at the time, attorney discipline was often delegated to the local bar association. Inquires there also proved fruitless. The Cleveland Metro Bar Association (successor of the Cuyahoga County Bar Association of Delahanty’s day) does not possess attorney discipline information from 90 years ago. The conclusion that Delahanty was probably disbarred, therefore, is only a statement of what should have happened to him. There is no guarantee that it did. 55 Joe Delahanty died in 1936 and older brother Tom Delahanty had moved away to Florida. 56 See, e.g., Hal Lebovitz, “Delahanty ‘Tragic Jumper,’ Brother Recalls,” Cleveland Plain Dealer, May 26, 1963. 57 The obituary published in the Cleveland Plain Dealer, July 27, 1966, referred to the deceased as Frank (Pudgie) Delahanty. This is the only quasi-contemporary reference to the putative nickname Pudgie encountered by the writer.